Every year I pick resolutions for myself that relate to my creative life, which means it's time to look back and see how I did. 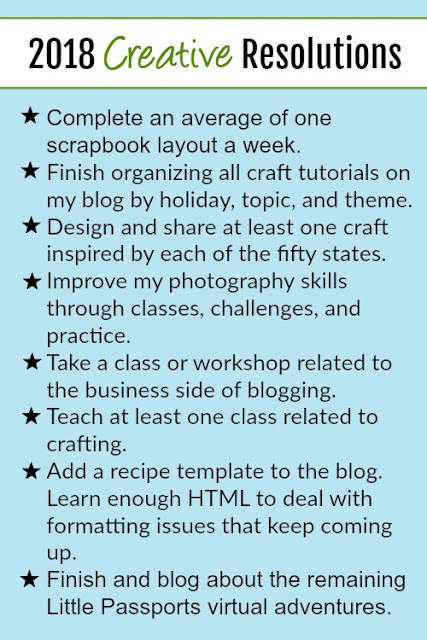 Complete an average of one scrapbook layout a week. Check! I made exactly 52 layouts. Migrate to Wordpress and make other changes to improve usability and attract more readers. Looking at this now a year later, I see that I should have split this into two or more goals. I actually joined a "Bloggers on Blogger" group and made an informed decision not to migrate to Wordpress. I made huge changes to improve usability throughout the blog. I'm calling this goal a success. Explore new ways to monetize the blog. Check! I've added more affiliates and am adding banner ads at the end of some of my posts. I added a single ad to the right-hand column. Blog revenue is small but growing. Check! I went to SNAP Conference in April and came home with new friends, useful business connections, a lot more knowledge about blogging, and tons of inspiration. Complete, photograph and share my craft room reorganization. Check! I love my newly-organized room! Improve my photography skills through classes, challenges and practice. Check! I took a photography class at SNAP and have been practicing with both my camera and my iPhone. I've progressed significantly with my photo editing skills. Try at least one new-to-me craft. Check! I took a crochet class at SNAP. It was fun, but I'm going to need a more instruction if I ever want to take up crochet! 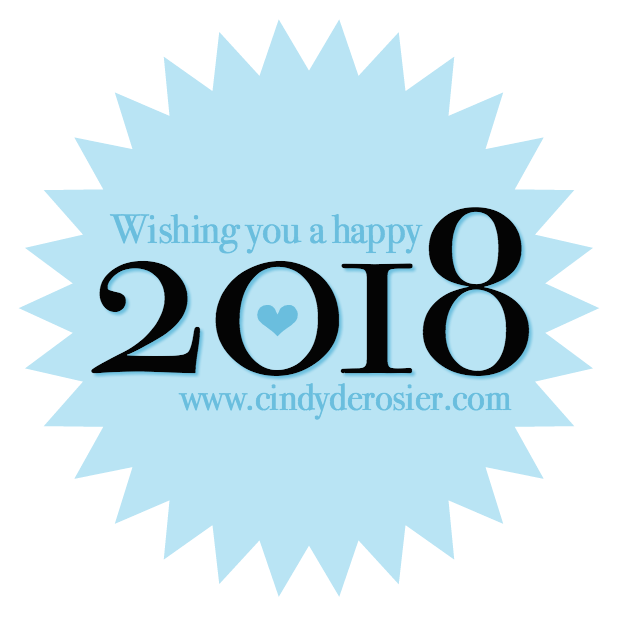 And here are my goals and priorities for 2018! Wish me luck! Did you make any resolutions related to creativity or crafting? I'd love to hear them! Love how goal-oriented you are my friend! And super-organized too. I wish you a fruitful and healthy 2018! May all your goals be accomplished! Good Luck... I generally fail if I'm too specific w/ my goals so I try not to be! I'll be happy to just get my craft room unpacked this year! 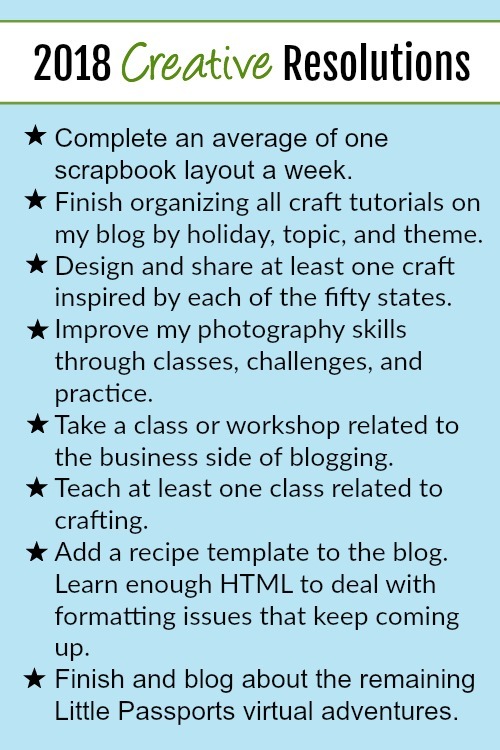 lol :) I love your goals and I highly recommend finding a knitting/crocheting group to join-- there was one local to me in Monterey and I have yet to find one here but nothing helps more than sitting down on a regular basis with your project alongside more experienced people to help you learn! I'd look for one via a local yarn store :) that said, after the basics, the more complex things you can do, I am self-taught. Lots of great things on YouTube (of course!) Happy new year!! !